If you want to add extra validation when students first login you have the option to force students to have an E-mail address. You can either upload an E-mail address that you might have on file or you can let students add their own E-mail address when they first login. On first login, if an E-mail exists on file, they will be shown the E-mail that is on file and will be required to verify that E-mail address with an automated message that we will send them. If they are providing their own E-mail address we go through the same process where students will be required to check their E-mail and click the verification E-mail. To turn this feature on, set the "Require Student E-mail" to "Yes"
When changing the Status "Require Student E-mail" to "Yes" it will automatically also set the option "Require Change Passwords" to "Yes" as well. On the upload student page you can optionally upload E-mail addresses for your students. Just select the matching column on your file and decide if you want to overwrite the student E-mail address if one already exists. If you did not upload an E-mail address the student will be prompted with this screen. If the student does not have an E-mail address and answers "No" to the question, they will receive a custom message that you can set in the System Settings. For students that do not have an E-mail address you can go into the student record and put a generic E-mail in to bypass this setting. If the student chooses "Yes" they will be prompted to add their E-mail address. They student will be prompted to check their E-mail and click the link to verify their E-mail address. The student will then create a new password and can continue to vote. This process will only happen one time and future logins will use the new password that the student has created. 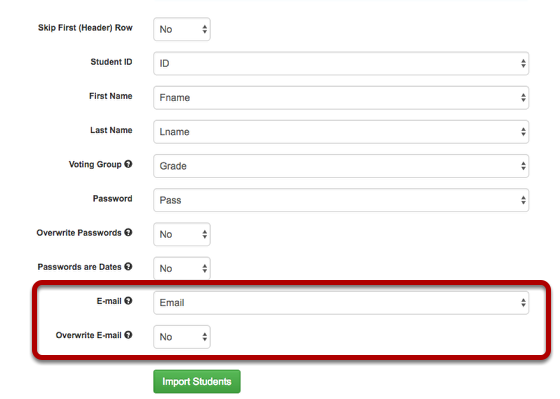 If you import student E-mail addresses, when the student logs in for the first time, they will see their E-mall address and if they click Yes an E-mail will be sent to them to verify (just as we do above) and if they choose no, they will get the custom message you set in the system settings.